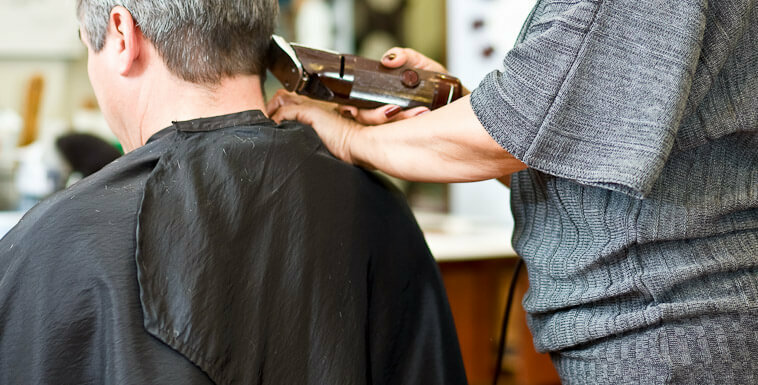 Back in 1981, our founder, Sig Abeles, was sitting in a hair salon in South Florida having his hair cut. Sig (known as Ol’ Blue Eyes to his friends and family) noticed that the cheap salon capes the stylist was using were falling apart and that the neck was too narrow for people with large necks like him. When asked the stylist agreed, but could only say "That's how everybody makes them." Having been a clothing manufacturer and a supplier of all types of garments to every major department store in the country, Ol’ Blue Eyes looked at the garment closer and realized that the quality of the fabric and stitching on the barber capes was poor. If this was the standard quality of hair salon apparel then something needed to change. Asking the owner of the salon how much the hair cutting capes suppliers had charged him, Ol’ Blue Eyes was shocked when heard the price. Inspiration struck and he told the salon owner that he could make him a larger and better quality hair cutting cape out of a better material and sell it to him for a lower price. Skeptical but intrigued, the owner gave Ol' Blue Eyes his first order: one salon cape. When Ol’ Blue Eyes returned with his first salon cape, the owner was absolutely stunned. He could not believe how big the barber cape was or how good it looked, saying that he had never seen a cape with a neck that large or with that many snaps. It was exactly what he had always wanted in his hair cutting capes and that first order immediately turned into a dozen more. Still not fully committed to changing the industry for hair cutting capes suppliers and barber capes suppliers, but curious as to what the possibilities might be, Ol’ Blue eyes took the opportunity later that week to go to some local beauty supply stores and see what other companies in the industry were charging for both their expensive hair cutting capes and salon smocks, as well as their cheap salon capes…and what kind of quality they were producing at both levels. What he found were basically two types of garments on the existing market: lower cost cheap salon capes of extremely poor quality and higher quality salon apparel at very high prices that still wasn't as professional, durable and stylish as it should have been. Sig knew that by selling directly to the salons and barbershops he could produce hair cutting capes & salon apparel of higher quality than anyone was making, and still offer them at a price that was comparable to the price that companies producing poor quality salon capes were charging. And Saloncapes was born. The business quickly picked up speed until Saloncapes.com was at the forefront of the wholesale salon apparel industry, providing high quality salon smocks at cheap salon capes prices. Ol' Blue Eyes started producing hair cutting capes and salon smocks and began to show them to local salon owners in South Florida. They were a little skeptical at first, but couldn't resist trying that BIG CAPE with the HUGE NECK, and they were even more intrigued by the wholesale prices he was offering despite the high quality material and construction. The orders started pouring in and the salons and barber shop owners started requesting other items such as hair color capes, barber aprons, salon robes, and hair stylist aprons. Best of all, Ol' Blue Eyes didn't just make the salon apparel how he thought they should be made, but rather encouraged salon owners and hairdressers to tell him what they truly wanted in the items. He also questioned them about what frustrated them in the existing hair cutting capes, chemical capes, and salon smocks they currently used. This is why we say that Saloncapes.com garments are designed by salon professionals, for salon professionals… because many of our innovations have come from the suggestions (and frustrations) that our customers have encountered in their businesses. Read More About the Saloncapes Mission. Since those founding moments, we at Saloncapes have continued to use these same ideas to create what we consider the most versatile, durable, and comfortable line of hair cutting capes, salon smocks, chemical capes, salon robes, and hair salon apparel in the industry. Over 35 years have passed since Ol’ Blue Eyes took that first order from our first customer. We now have thousands of salons and barber shops as loyal customers all around the United States and beyond. And because we provide quality products at wholesale prices, we are able to service salons ranging from small, one chair barbers, to huge mega salon-spas. We pride ourselves on treating every customer (big or small) as if they were our only customer, handling all salon apparel or custom barber capes order with equal importance because we know that this is the key to establishing long lasting business relationships. At Saloncapes, we give you top quality, world class service AND an affordable price! We provide the highest quality salon capes and salon apparel in the business, the most outstanding service in the entire industry, and low factory-direct prices! We know once you use our products, you will be a friend for life. Become A Salon Capes Customer Today!